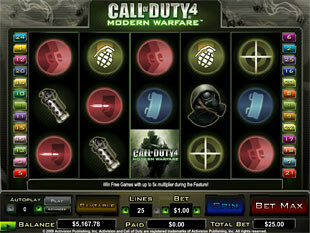 Call of Duty 4 Slots is a thrilling 5 reel 25 paylines game with featured graphics and a fantastic bonus game. This slot machine was developed by Cryptologic experts and released in 2009. The strong and brave special unit soldiers fight against terrorists to protect us from the most horrible dangers of the modern world. Being top-class soldiers, they are awarded well for their successful operations, and the sums may reach the top jackpot of 5,000 coins or $100,000. Their unique skills help to struggle through to the top goal, along with trying luck in a fantastic Bonus Game on the second screen. You will also be pleased to know that it is possible to play Call of Duty 4 Slots in a no download version, too. Incredible graphics and lots of animated items make this game really attractive and pleasant for your eyes, so you’ll enjoy every little second playing it. Featured sounds, along with the exciting graphic features, make Call of Duty 4 Slots so realistic that in a certain moment you may even not differ it from a real counter-terrorist operation. You are given a unique chance to help the special unit soldiers with fighting terrorists through striking winning combinations on the reels. To join the fight for good future you need to hit the following symbols appearing on the screen: Pistol Trigger, fast Bullet, AK-47, Grenade, protective Mask, Magazines, Target, Crawling Soldier, Blinding Grenade, Terrorist, Shooting Soldiers, and Call of Duty Logo. This game also allows you to try your luck with a really wide range of coin sizes: $0.01, $0.02, $0.03, $0.04, $0.05, $0.10, $0.15, $0.20, $0.25, $0.50, $0.75, $1, $2, $3, $4, $5, $6, $7, $8, $9, $10, $11, $12, $13, $14, $15, $16, $17, $18, $19, $20. The unbelievable bets choice opens before the players an intriguing opportunity to try their luck with different money staked. If risk is your nature you can make the highest bet of $500 per spin, and try yourself in winning really huge sums. This maximal bet makes the game specially exciting for high-rollers, but the careful players will also have a chance to enjoy it, as they are offered to stake the minimum varying between $0.01 and $0.25: it only depends on the number of lines you choose. The highest jackpot is 5,000 coins or $100,000 for 5 Shooting Soldiers wild symbols. The second jackpot is 250 coins or $5,000 for 4 Shooting Soldiers wild symbols. The third highest jackpot is 200 coins or $4,000 for 5 AK-47 or Terrorist symbols. In this game the Shooting Soldiers of a special unit work for wild symbols, allowing you to get fascinating combinations even if you miss one or several symbols. The soldiers will be happy to help you in this case by substituting for any other icon, except the Call of Duty Logo, which is the scatter symbol in this game. Also, in this game any symbol may explode randomly and become a wild one. This fantastic slots game allows you to strike even more combinations with scatter symbols appearing on the screen. It doesn’t matter, where they appear: a combination with them is done wherever they are, helping you to win even more. 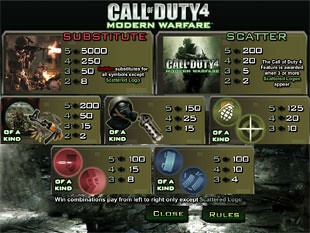 In this game the Call of Duty Logo serves as the scatter symbol, and if two or more of them appear on the screen you get some benefits. If 2, 3, 4 or 5 scatter symbols are hit, your total bet gets multiplied by 2, 5, 20 and 200, respectively, so you have really exciting chances to win serious sums reaching the maximum of $100,000 in this game. Also, if three or more symbols appear on the reels, you are awarded an amazing bonus game on the second screen. Bonus Game. 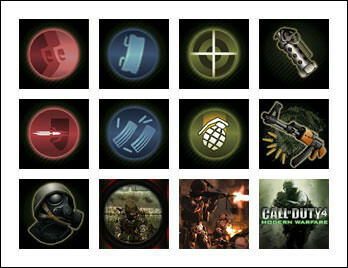 Call of Duty 4 Slots suggest you to play a bonus game in order to win some intriguing numbers of free spins. To start the bonus game you need to hit 3 or more scatter symbols on the same screen. 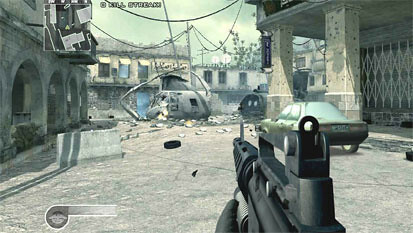 The game is played on the second screen and suggests you to take part in a real operation against terrorists. In the bonus game you need to shoot terrorists appearing on the screen. The more enemy you shoot, the more free spins you are awarded. During the free spins awarded in the bonus game your winnings get multiplied by 2, but you can increase the multiplier up to 5 by headshooting the terrorists. To give you an example, while playing this bonus game with only $0.01 staked per line we managed to get 21 free spins and to win over $30 with a double multiplier. Can you imagine how big the winnings can be if you stake more? Call of Duty 4 slot machine is a breath-taking game allowing you to go deep into the world of special unit soldiers and to fight against terrorists along with winning really huge sums of money. Fascinating design, wide bet range and an amazing bonus game make this game a great money-making option for action slots lovers.